Nintendo of America boss Reggie Fils-Aime believes that Nintendo did everything right with the latest game in the Metroid series, Metroid: Other M.
On paper, Metroid: Other M sounds like one of the best games in the world: the 2D gameplay of the classic Metroid games, mixed with the 3D gameplay of the Metroid Prime series, and made by Team Ninja, a studio with a long history of making excellent action games. But the game has sold much more slowly than Nintendo expected, and Fils-Aime says that the company isn't sure why. Fils-Aime said that Team Ninja and Nintendo's Yoshio Sakamoto had done a great job with Other M, adding that consumer reaction to the quality of the game had been very positive. Unfortunately for Nintendo, that positive reaction hadn't translated into strong sales. Nintendo had hoped to sell a million copies, he said, but it was clear that that wasn't going to happen before the end of the year. Fils-Aime didn't think that these slower than expected sales were the result of ineffectual marketing, saying that the presence for Other M, both in terms of traditional advertising, and social networks, had been very strong. 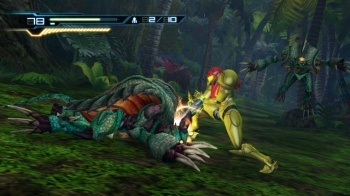 Fils-Aime also touched on the complaints about characterization of lead character Samus Aran, which a number of reviewers - including our own Steve Butts - commented felt different, and much less appealing, than it had in previous games. Fils-Aime didn't think that this had been the reason for the poor sales, although he did acknowledge that there might be some validity to the complaints. Despite Fils-Aime's comments, it's almost certain that Nintendo has been monitoring gamer reactions to Other M and thus is well aware of why people didn't like the game. As a high-ranking Nintendo executive, Fils-Aime isn't about to openly criticize Other M to the press, regardless of his personal feelings. Any confusion that Nintendo might be experiencing is likely just the company trying to figure out what do with the franchise next.